Last weekend was Old Settlers Reunion in Cissna Park, IL. Robin got to go on several different rides, but I think his favorite was the big slide. 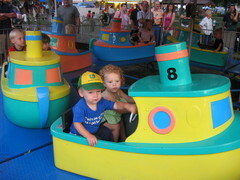 He also had his first blind date, he took her for a ride on the boats. Wonder what I do at work? Another, more detailed release on the UIUC News site.